Whenever we visit India, people we know as well as people whom we meet for the first time ask us the same question – Why does USA like NonPakistan so much? Some elaborate by pointing out India is so much bigger, so much more advanced and a fully democratic good society. Then they ask plaintively what does NonPakistan have that makes America like them so much? The fact that Indians ask this question shows how naïve they are as a society. We gave a longer answer two weeks ago in Section 2 titled NonPak – Vital to US Foreign Policy of our article America-NonPakistan-India – The Cycle Continues. The basic truth is that even if almost all of the points in our long answer were to be resolved and even if America were to abandon NonPak, that terror-infested, corrupt regime will still be courted by other major powers. Why? The simple answer is Geography, superb strategic Geography. Naïve British-obedient Indians never appreciated & still don’t understand how brilliant the British were in creating the geography of that breakway part of India called NonPakistan. They still don’t get that geography is permanent and nations have to seize land to change geography in their favor. India didn’t get that in 1948 but China did in 1949 and continues to not only get that profoundly simple concept but act on it as they did once again this week. A land link to the Persian Gulf for Eurasian powers which have for centuries desired such land access to those warm waters. The only way for Eurasia to outflank Iran for such access and simultaneously put pressure on Iran. The ability to link and to cut off that link to Central Asia from the fertile Indo-Gangetic plain. the link to Afghanistan, the intersection where all roads in Eurasia meet. Now you understand why every major power in Eurasia has controlled the land of NonPak in its heyday. The Indian Civilization was developed along the banks of the Indus River, the river that gives the Subcontinent its name. The ancient Indian empires owned this region until about 500 BCE and then exchanged control with the ancient Iranian empires till 300BCE. This was the land that Alexander invaded and then got destroyed as he ran back with the remnants of his army to the Arabian Sea to flee to Greece. This was followed by centuries of ownership by Indian empires. The masters of this land changed for good in 1000 CE. The Muslim Conquerors from Uzbekistan & Afghanistan swept down the Indus plain and conquered this land. Only after consolidating their power in the Indus plain, did they move across to Delhi to conquer today’s India. The seafaring British cared more for this land than anyone in the past. They expanded this land by annexing the province of Balochistan, until then a property of Iran. That enabled the British to get strategic control of the Straits of Hormuz, the small chokepoint that controls access of the Middle East into the Indian Ocean. This access came via a superbly located deep-water port named Gwadar, the same port that China went calling for this week. The British ceded all their naval bases to the United States after World War II. But the US, despite its affection and great need of NonPakistan, never really cared for Gwadar or Balochistan. They didn’t need to because the US had control of the entire Persian Gulf through allies in Qatar, Bahrain, & Saudi Arabia. But China is different, very different. Frankly, no other nation in the past 70 years has understood the British Empire more or better. Chairman Mao & Zhou En Lai dreamt big, very big when they won China. They wanted to restore China to its old glory as a great empire. They understood better than anyone the importance of the land access to Eurasia across the old mountains as well as the importance of land access to the Persian Gulf. Both are necessary for China to emerge as the next empire in Eurasia. Imagine the enormity of their vision, the boldness of their dream in the 1949 China that lay poor, destitute and weak relative to USA, USSR and Europe. Besides vision and dreams, Mao & Zhou had singlemindedness of purpose and superb tactical implementation skills. They walked into Xinkiang in 1949 and took that enormous province without any real resistance. That gave China access to regions of the old Turkish empire. Today Xinjiang is China’s largest province. Then a few years later in 1951 they walked into Tibet and annexed it. Tibet is China’s second largest province today, an enormous treasure trove of water, minerals and other natural resources. We called this annexation the Greatest Acquisition of the 20th Century. Now they had two huge strategic landmasses but these two did not have any land access to each other. So the Chinese began building a road through remote Indian territory and then simply annexed this land mass called Aksai Chin. Look how strategic Aksai China was for China? It provided the ability to build roads between Tibet & Xinjiang and it brought the Chinese Army right on top of India’s Ladakh & Kashmir areas. China understood the enormous importance of this geography and simply annexed it from a helpless India. And India’s Prime Minister Nehru dismissed the importance of this annexation by telling Indian Parliament that “not a blade of grass grows there“. With Aksai Chin connecting Xinjiang with Tibet, China now had direct road access all the way from the Eastern end of Himalayan range bordering South Eastern Asia to the old Turkish dominions at the Western end of the Himalayan range. in Central Asia. The Himalayan range was now Chinese property. And this was back in 1958. But this was still incomplete. China really needs land access to Afghanistan to get across to Iran, Iraq & further. And China’s Xinjiang still doesn’t have direct land access to Afghanistan. But China is very patient besides being opportunistic. And China has a bigger problem to deal with – the vitally important chokepoint of Malacca Straits in the Indian Ocean, a narrow strait that carries almost all of China’s oil from the Middle East & Africa to China. That can be blocked by the US Navy either alone or in conjunction with the Indian Navy. So China still needed a land access to the Persian Gulf. Which regime has that? That regime with the superb geography called NonPakistan. And what do the generals of NonPak want above all? A big patron who can give them nuclear technology, arms and huge sums of money. The USA needed NonPak but not that much. So the US only gave the generals just enough to buy from them what little US wanted. But China wants so much more and what China wants is so critical to China’s long-term interests. So this week, President Xi Jin Ping of China went to Islamabad to buy that access that had eluded Russians for centuries and to get a meaningful diversification from its dependence on Malacca Straits. 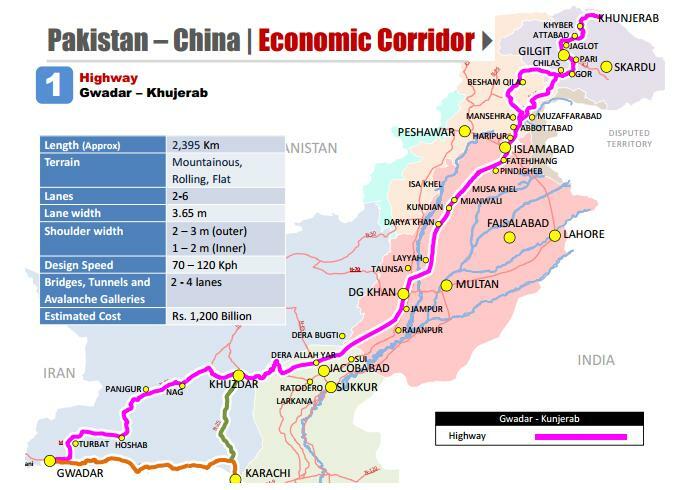 China bought a road (& later train) access from Kashgar in Xinjiang to Khunjerab pass across the Karakorum range and then all the way across the Northern Kashmir across the Indus plain to Gwadar, the port at the entrance of the Straits of Hormuz. This road & rail access can ship oil from Gwadar to Xinjiang & China without entering either the Indian Ocean or any territory dominated by the Indian Military. The same road/rail access can ship finished products and Chinese labor from Xinjiang and China into the heart of NonPakistan financed by Chinese money. And yes, this Chinese money will be used to build power plants in NonPakistan, an investment that regime needs very badly. Simply put, Gwadar becomes the “driver of connectivity between South Asia & East Asia“, from the Persian Gulf to the Eastern end of the Himalayan range bordering Myanmar. China was denied all this for the past 5,000 years and now Xi Jin Ping has obtained it for China. But what about the risk of terrorism in NonPakistan? Chinese are not dumb. NonPak is creating a special military force of 12,000 to provide security for Chinese engineers, labor and of course the Chinese road. This force will have its own air wing and will be commanded by a two-star general. Doesn’t this remind you of the early British ventures in India protected by Indian troops? Speaking of India, all of this Chinese expansion has come at the expense of India and through land that belongs to India, at least on 1947 paper. Tibet was an Indian protectorate which China annexed; Aksai Chin was Indian territory that China annexed. Northern Kashmir (green area in the map below) was Indian territory that NonPakistan captured in 1948. This is the territory called Northern Areas through the Chinese road to Gwadar will run. What had India done since 1948 to stop this Chinese annexation? Nothing except register diplomatic protests. Doesn’t that remind you of the behavior of Indian kinglets as the British began annexing parts of India in the 18th century? That land called NonPakistan welcomed China this week as it welcomed Britain 225 years ago, as it welcomed Uzbek invaders 1000 years ago and as it welcomed Iranian masters 2500 years ago. The more things change, the more they stay the same. How visionary were Mao & Zhou? What incredible spirit did they instill in the Chinese leadership? What a great blend of big vision and patient, opportunistic, determined implementation over 70 years and for many more years to come? Doesn’t that remind you of Britain of 18th century? As we said, the more things change, the more they stay the same. Editor’s Note: Regular readers know that we have formally deleted the word Pak-istan from this Blog. Because the utterly heinous term means land of the “pak” or religious pure, a name that serves as justification for religious cleansing of Buddhists, Hindus, Jains, Sikhs, Ahemadiya & Shia Muslims. The more correct term for that regime is NaPak-istan. But we practice journalistic temperance and so use the neutral NonPak-istan term. Western people have rejected “master race” as a valid concept and would never tolerate that term as name of a state. Yet, they blithely use Pak-iStan. Is that because the victims are Indian & not European? Note that “master race” is a much more moral term than “Pak-istan” because a master race needs servant races while a “pak” regime is forced to cleanse out impure religions to keep their land “pak”.